Something Sweet Closed by Health Dept. Something Sweet, the small bakery on the corner of 11th Street and First Avenue, is “closed for now,” according to a sign in the window. The bakery’s display cases were empty and its gate was down on Tuesday. Health Department records show that it was forced to close following an inspection on July 2 that found a missing food protection certificate, evidence of mice and flies, and food that was contaminated or not discarded properly. The shop has closed unexpectedly a few times before. Hope you had a wonderful Fourth of July celebration last night. The folks over at EV Grieve have two sets of vandalism photos this morning; in one series, someone has spray painted cars parked along East First Street. 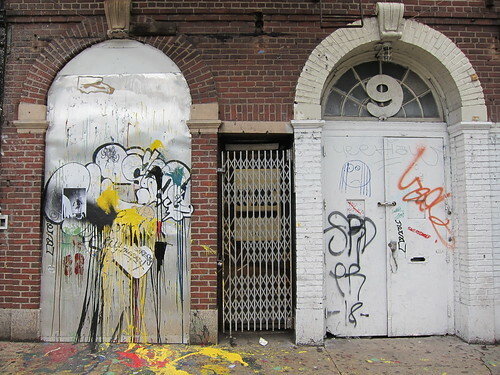 In the second photo, someone has spray painted the Subway restaurant that will be opening soon on Avenue B.
Grieve also reports that there will soon be a new bakery on St. Marks Place. The new bakery, which an on-site worker said will open in two weeks, will be located at a spot that previously held thrift store-boutique Junk. Junk closed in early March.